Restaurants and manufacturers in particular need fire insurance coverage in order to safely operate. However, all business owners like yourself should invest in fire insurance coverage. After all, every business entity is at risk of fire in numerous ways. If a natural disaster occurs that results in a fire and you do not have fire insurance, your damages will not be covered. Thus, you will be fully responsible for paying for your losses and business interruptions. To ensure that your financial situation does not worsen in the case of a fire, find an insurance policy that includes fire insurance. 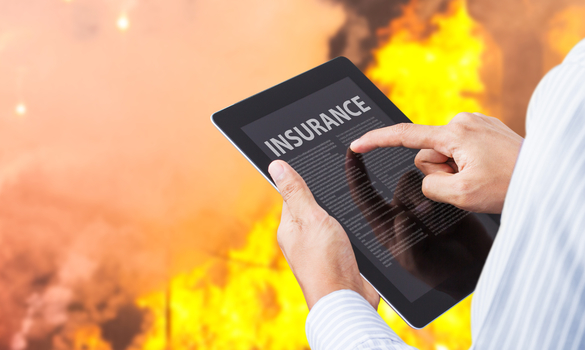 Read on and learn what fire insurance coverage for business includes. Fire insurance coverage for business typically includes fires caused by electricity. Most policies include this type of coverage because almost all businesses operate in facilities that highly utilize electricity. If you work in an office and use computers to conduct work, you are relying on electricity yourself. Businesses that use more electricity on a daily bases have higher chances of suffering from an electrical fire. In the case of faulty wiring, a fire could occur. In addition, gas explosions can cause fires in office buildings as well. You can have a class A office space and still have electrical issues. Protect your business, yourself and your employees from electricity-caused fires by getting fire insurance coverage. Many businesses also get fire insurance coverage to protect their losses. If a restaurant catches on fire, the restaurant owner does not want to be responsible for the losses. The same goes for the owner of a catering business. After all, commercial kitchen equipment is not cheap. If you combine such equipment with dining appliances such as tables, silverware and china, payments add up quickly. Restaurant owners who have fire insurance coverage that protects their losses due to fire do not have to worry about finding the money to purchase new equipment. Such owners can continue running their businesses sooner because they can obtain the money quicker and renovate their restaurants faster. Get fire insurance to gain coverage for any losses due to fire. Also, get fire insurance coverage to protect your business from damages due to smoke. Many business owners fail to realize that damages can occur from the smoke from fires as well as the fire’s flames themselves. If your business operates out of an office building, you are subject to smoke damages even if a fire occurs in another office within your building. Since smoke rises, offices located on higher levels of buildings often suffer from more smoke than those located lower. Regardless of where your office is located in your building, you should protect your appliances from smoke by getting fire insurance coverage. Fire insurance coverage for business also usually offers operating expenses. In the unfortunate case that a fire occurs in a manufacturing warehouse, the owner may have to evacuate and continue conducting business elsewhere if the damages are extreme enough. After all, employees cannot produce quality products in an unworkable, unsafe location. For this reason, most business owner’s insurance policies cover operating expenses for companies that are forced out of their location. To allow businesses to continue working and making a profit, they assist them in paying for new means of operating. In this way, fire insurance coverage greatly benefits businesses of all kinds. Use a business plan builder to establish ways to continue conducting business in the case of a fire. In doing so, you will set yourself up to fully take advantage of fire insurance coverage benefits. Finally, fire insurance policies provide business owners with temporary business interruption coverage. Return to the possibility of your fire damages being too bad to continue operating in your current building. While you will need to pay for new means of operating, you also need to pay for a new location to work in. If you do not, you will not be able to provide your customers with the products or services they ordered prior to the fire you endured. Fortunately, with temporary business interruption coverage, you can move your business to a new location. As a result, you can provide your customers with their orders in a timely manner and keep their satisfaction levels high. Get fire insurance coverage to continue profiting regardless of the fire damages. Whether you are a restaurant owner, a manufacturer or a retail business owner, you need fire insurance coverage. If you get it, you will gain protection from fires that occur due to electrical issues. The assets that you lose in a fire will also be covered. Any business assets that get damaged by smoke from a fire will be covered as well. Most fire insurance policies take care of operating expenses for businesses that have to relocate after a fire. They cover temporary business interruptions by assisting business owners in getting new, temporary work locations as well. These are the factors that fire insurance coverage for business includes.